Mango is extremely cheap in Singapore these few weeks. I bought 7 large mangos for only SGD5. All are fresh, firm and sweet. 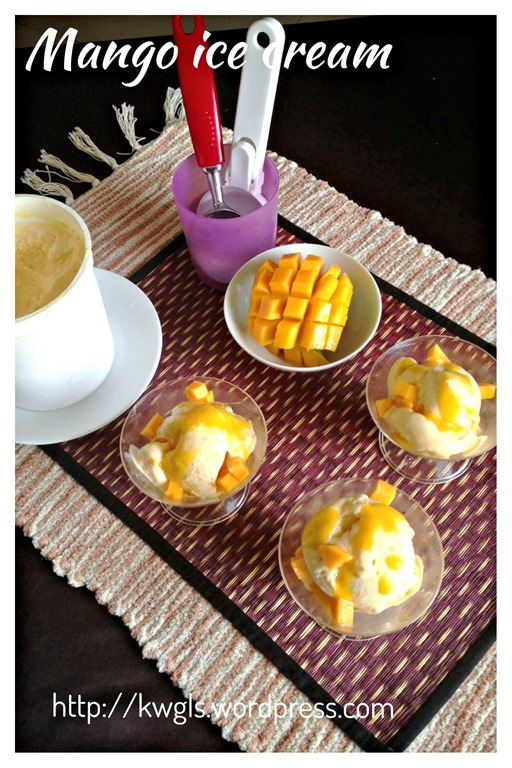 Besides making Mango Puddings* , the very first thing that comes to my mind is to make mango ice –cream. I promised you that this will be a short post and the recipe is extremely simple and you can easily preparing at home. I have use the short cut method of preparing the ice cream here. I blend everything together and freeze it for overnight. 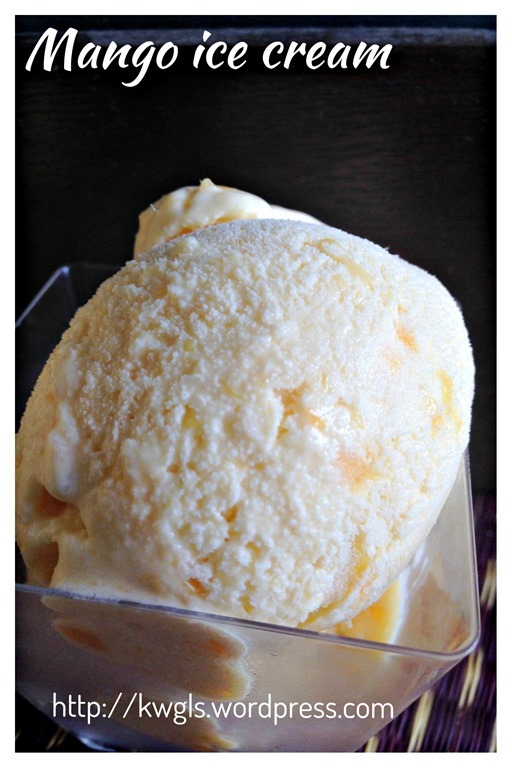 So it is a denser ice cream. 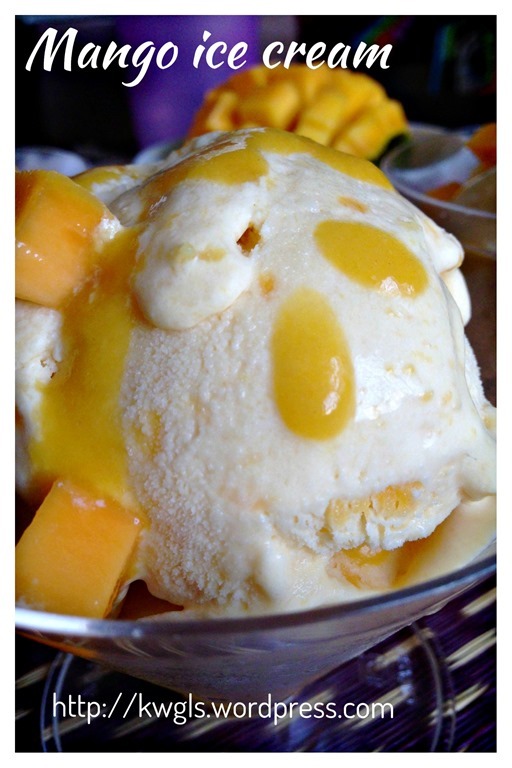 However, if you wish to have lighter ice cream, you can beat the cream until firm peak and fold in the mango puree until well combine. That will provide you a lighter ice creams. 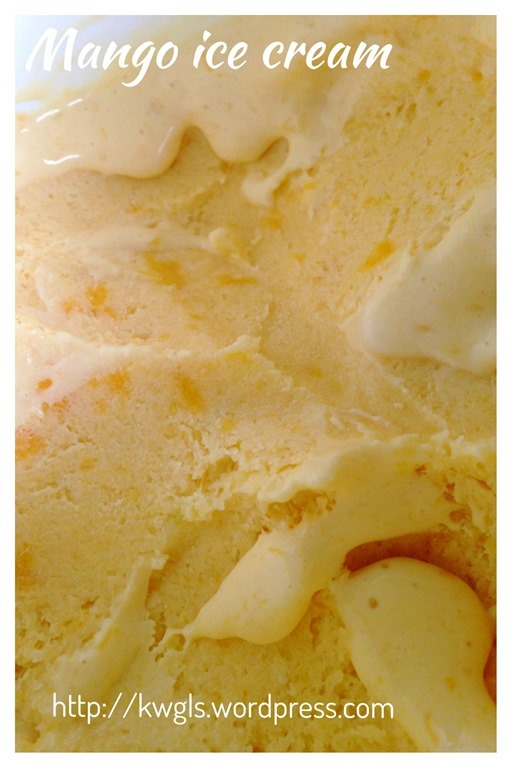 As usual, i have difficulty to take picture for my ice cream due to the hot weather. My ice cream starts to melt in the process of picture taking. Pardon me for this rather messy picture. 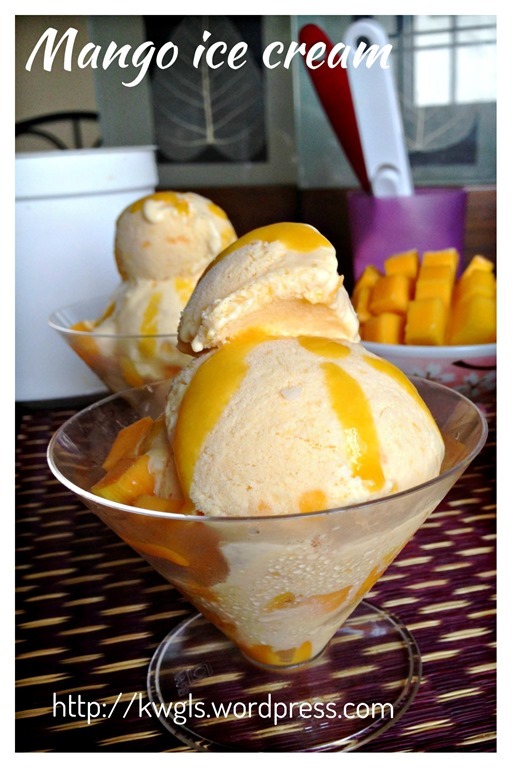 Method 1: Put the mango flesh in the food processor and blend as fine as possible. Add in the double cream and condensed milk. Blend until well combined. Transfer out and chilled in the freezer until the ice cream is set. At least 8-10 hours. 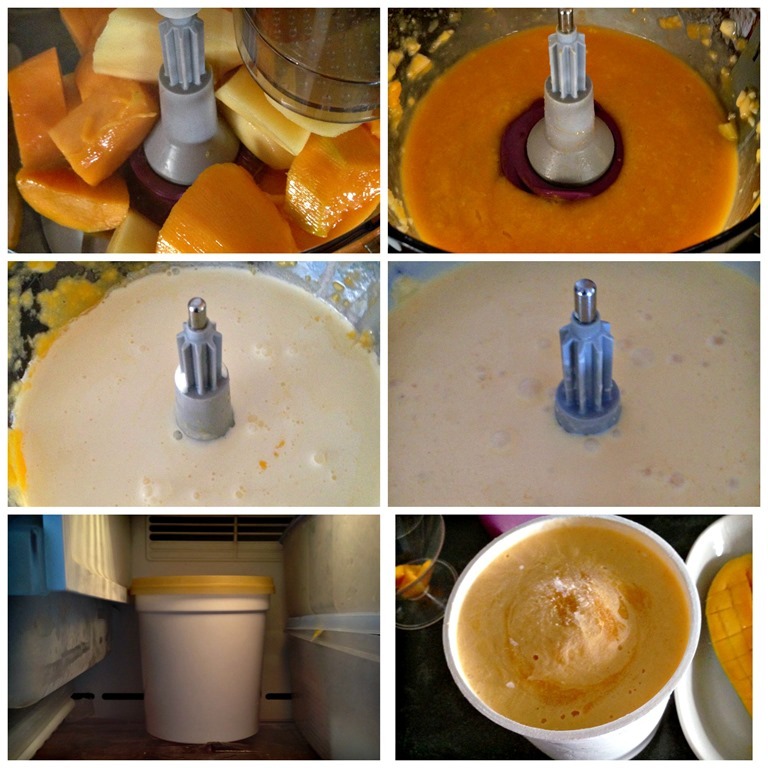 Method 2: Put the mango flesh and condensed milk in the food processor and blend as fine as possible. Transfer out and set aside for later use. In a clean whisking bowl, beat heavy cream until firm peak. 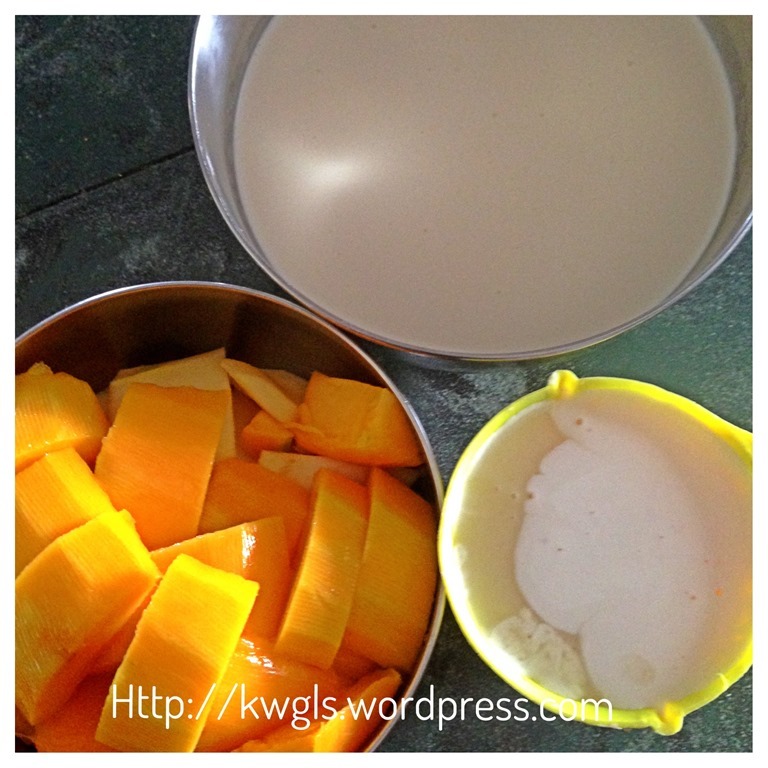 Fold 1/2 of the cream to the mango puree lightly. 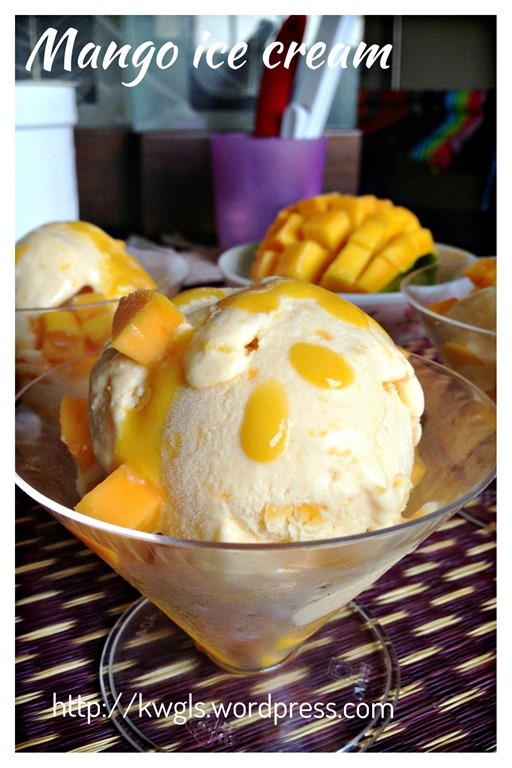 Perform the same for the other half of the mango puree. Fold until well combined. Transfer out to a desired container and chilled in the freezer until the ice cream is set. This method of preparation will yield a bigger volume of lighter ice cream. 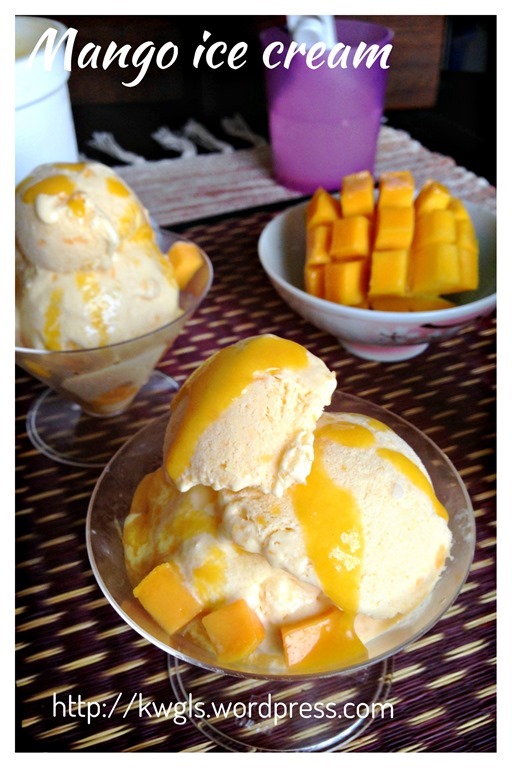 Mango is in seasons and this is definitely a good way to use the cheap mango. Do give it a try and let me know if it suits your taste buds. Hope you like the post today. Cheers and have a nice day. For more recipes, you can refer to my RECIPE INDEX (updated as at 21 March 2014) here and you can follow me at PINTEREST or visit the blog’s FACEBOOK PAGE to keep abreast of my future posts. You can also join the FOOD BLOGGERS AND FOODIES UNITED FACEBOOK GROUP to see more recipes. Currently there are about 9,800 members sharing various food photos . I am posting my daily home cooked food in the above Facebook Group daily. I would be more than happy if you can post in the Group for the recipes that you tried from my blog. If you are a Pinterest user and you are interested to have more recipes, you can join or follow this Pinterest Board set up by me where there are more than 2600 recipes worldwide and pinned by various bloggers: FOOD BLOGGERS AND FOODIES UNITED PINTEREST BOARD. 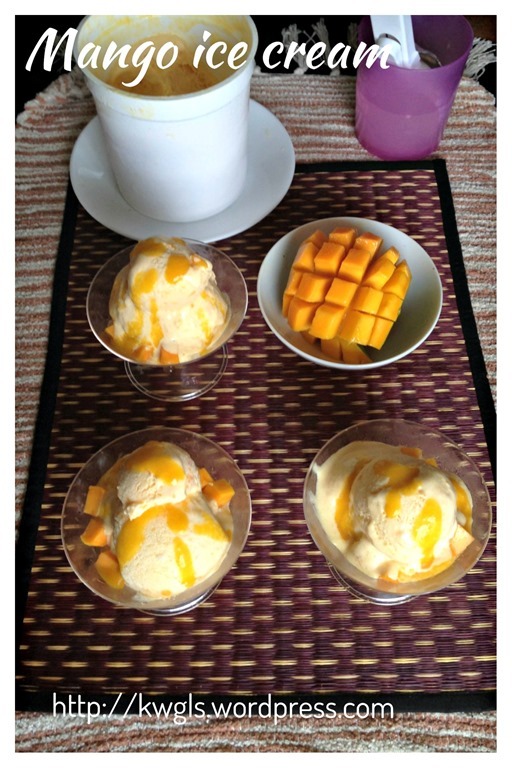 This entry was posted in Desserts, Food Preparation Series and tagged 8, 芒果冰淇淋, GUAI SHU SHU, Guaishushu, kenneth goh, mango ice cream, mango lassi, mango sorbert, postaday. Bookmark the permalink. Hello Kenneth! I love mango so this is a real treat for me. I love the recipe with the condense milk and cream. I’m going to pin this so that I may try it later. Thank you! Hi Kenneth, can I use thickened cream instead of heavy cream ? Yes, double cream, thickened cream and heavy cream all can be used. Ya, do try and let me know if it suits your tastebuds. 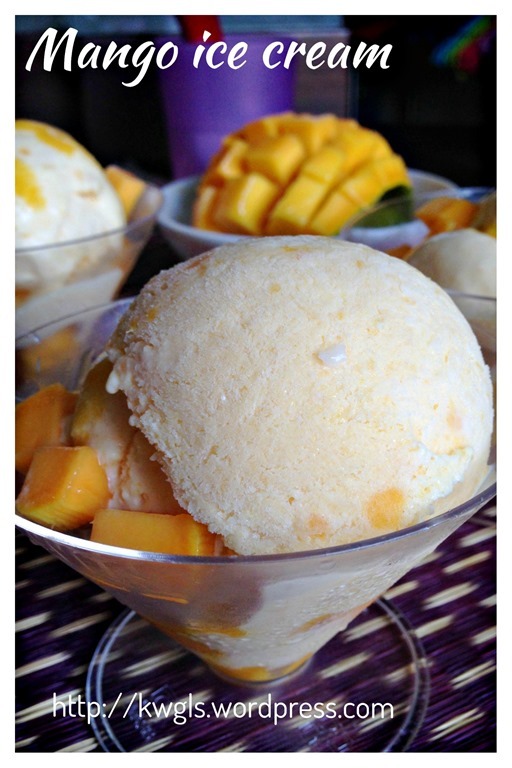 Kenneth can i substitute the 500g mango wirh 500g pineapple, 500g yam etc to make other flavors? 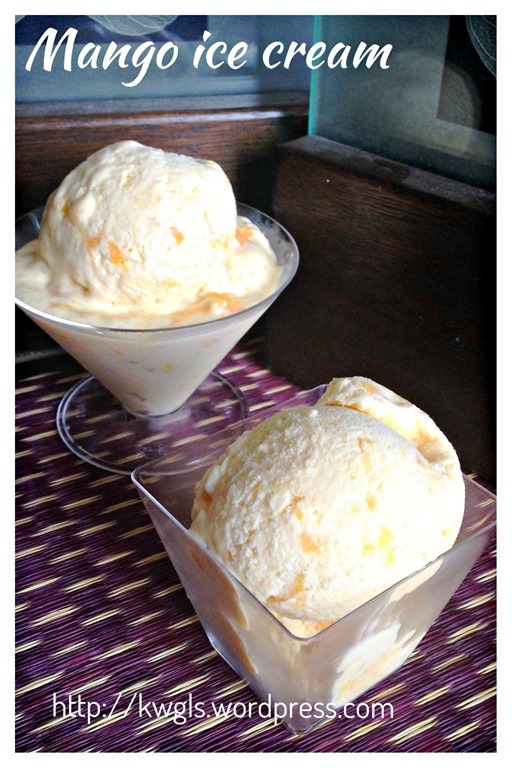 do you have recipe for vanilla ice-cream? When my recipe used cup, please do not convert. It is using measuring cup. it will be standard throughout the recipe. Rice cooker cup will do as long as ratio is correct. Does icing sugar work in replacement of condensed milk? No, it will not be creamy at all..
hi Kenneth , I’m going to try it with frozen raspberries. Pray it works.